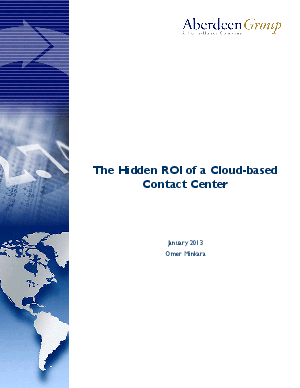 Six out of ten contact centers projected to have a cloud-based contact center deployed by the end of 2013. Why? Ultimately, because it will help them be more responsive to their customers, without the prohibitive costs of carrying enough premise-based technology to cover demand spikes. In this concise analysis of two recent contact center executive surveys, Aberdeen Group analysts discuss how cloud-based infrastructure enables contact centers to excel in key activities including center activity reporting, agent performance feedback and more. Serve customers more reliably, with 36% less downtime and enhanced security and backup facilities compared to premise-based technologies.